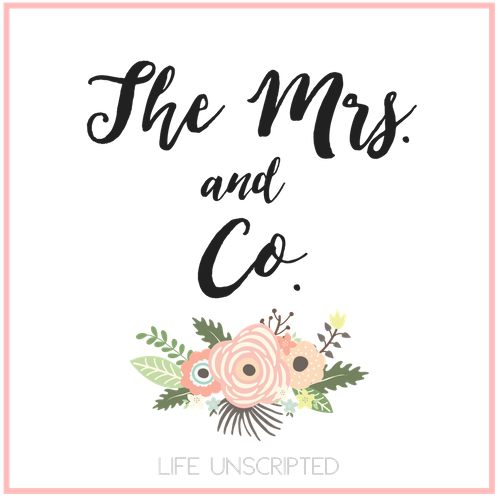 I just can't help it - The Mrs. & Co. When we got pregnant in November I didn't realize the emotions I would feel with a pregnancy after a loss. I lost our first baby on July 31, 2013 at about 7pm. I was getting ready to go to dinner with 2 of my dearest friends. I had been cramping since about noon and the cramping continued to get worse as the day went on. I had called my doctor's office and they said it was all normal and to call back if I started bleeding, which didn't start until 7pm. I was alone. Kyle was at work. I immediately called him crying so hard he could barely understood me, but he knew. His response to my cry was "I'm coming." How could this happen? We had JUST shared the news with all of our family which is about 75 people! Both of our parents are 1 of 4 or 5 siblings so we have TONS of aunts and uncles and cousins. How was I going to handle telling everyone that I had lost the baby? Thankfully I had a cousin on both sides of my family that handled telling everyone and Kyle's parents handled his family. I texted my RE (yes, he gave me his cell number if I ever needed anything, one more reason I love him) and he said for me to come in the morning for blood work to confirm the miscarriage and if the bleeding got worse to go to the nearest ER. I don't know if I should have ever gone to the ER that night. The pain got worse and so did the bleeding. It just wouldn't stop and every time I went to the restroom it was a constant reminder that my baby was no longer inside me. A miscarriage includes labor. Yes, it's alot shorter and not as intense because your body is not pushing out a full size baby, but it's still the same concept. Your body is pushing out what's inside you. It was very hard for Kyle to watch me lay there, obviously in pain, and he couldn't do anything. He kept asking if we should go to the hospital. I told him I was not going to pay money for them to tell me what I knew was already happening. I finally resorted to a vicodin. I knew what was happening and knew it couldn't hurt the baby that wasn't there anymore. I finally was able to relax and fall asleep. The next 2 weeks included many blood tests to watch my HCG levels drop. Thankfully it only took about a week and a half for it to reach zero and I only bled for about a week. I had heard stories of women bleeding for 2-6 weeks and I couldn't bare the idea of being reminded of the loss. I was lucky. This post was supposed to be about being pregnant after a loss, but I've never written about our loss. Maybe that will help me enjoy this pregnancy, because honestly I am scared. So scared that for the first 2-3 weeks of this pregnancy I was CONVINCED I was losing the baby. Thank the Lord that my RE and nurses were so understanding and let me come in many times for blood work and sonograms to make sure baby was doing alright, which it was, every single time. I am tired of being told not to worry. Especially by people who have never had a loss. They just don't get that I can't help it. My body is reacting to the feelings it's hard before. The cramping I have now from my uterus growing and making room for our sweet angel are the same cramps I felt the night I lost our baby. Spotting I had on the day I lost our baby was the same spotting I had during weeks 6-8. I try not to let it bother me, but women who have dealt with infertility and loss are very sensitive and I wish every person would understand that. I guess I can't expect that from everyone. Every week that passes and every time I get to see our baby, I feel better. I pray that I'll eventually be able to enjoy the pregnancy, but for now, I just need people to cut me some slack. Stop telling me "not to worry", but instead tell me " I understand why you're worried. It's ok and I'm here for you". I totally get you need for worry. I was the same way, until it finally dawned on me that I was going to worry away my pregnancy. I then promised myself, which of course was hard, but to only worry if I had reason to. So when I spotted in the beginning of my pregnancy, I was "allowed" to worry. When I had an appt to see my baby in the beginning I was allowed to worry. My biggest thing was having a doppler at home, where after 12 weeks I could listen to the baby myself and give myself the best piece of mind. This allowed me to actually enjoy the rest of my pregnancy from here on in. I can say since feeling the baby move, I haven't used the doppler, but if the baby was having a slow day, I just pull it out and instantly feel relief!! Knowing that this could be my last pregnancy makes me want to enjoy it all that much more, even with all the bumps in the road over the last little while. So as much as I want to tell you to relax and not worry, I know it won't happen and I respect it, but at the same time, I don't want you to remember you pregnancy through concerned eyes, I want you to embrace it and enjoy it for everything it is - after all you are growing a human and that alone is a miracle. I hope this helps you. I could have probably written the same post when we finally got pregnant with my son after we tried for 2 years and were dealt a devastating miscarriage. My RE was wonderful and did the same thing yours did. I felt like such a crazy patient since I might as well have moved in there during my first trimester. "Graduating" from their office was such a bittersweet day for me because I felt so sad leaving such a great group of supporting medical professionals but happy that the day had finally come! The worry subsided during my 2nd trimester but ramped up in my 3rd. Looking back I wish I could have enjoyed the pregnancy more. In some ways I feel like I missed out on the experience because of it. Although trust me you seem to be in much better shape than I ever was! Only the people who have been in your shoes will understand which is what makes the internet community so great. I had a friend who got mad at me that I didnt share more of my pregnancy with her but there's no way she could have understood. Hang in there! I totally get it. It took us a over a year to get pregnant and when it finally happened people would say, "I told you so! You just had to relax!" Um no. Not okay. Shut up. haha yes! Exactly! Um no. Shut up. Thank you for that laugh! I can totally relate.....I haven't had the pregnancy after loss yet, but have had the loss. One of the first things I did after my miscarriage was call one of my best friends that had suffered miscarriages and told her I was sorry, sorry that she EVER went through what I was going through....it also increased my respect for her and her faith in Christ. I have often thought about the fear that will likely come should we be blessed to get pregnant again. How I will likely psycho analyze everything. So hard. Remember how you are dealing with it so you can remind me down the road! Praying for peace for you my friend. I do love how God has used these losses to bring his sisters together, to support one another. Once baby Sanderson makes their debut, I want to see you, hug your neck and meet him/her. Have a blessed day! Oh my god. You pinned it. Hit the nail right on the head. Love the end. It's so true. Could have written that myself!! So glad we connected! I am looking for this thanks for sharing it will help others.